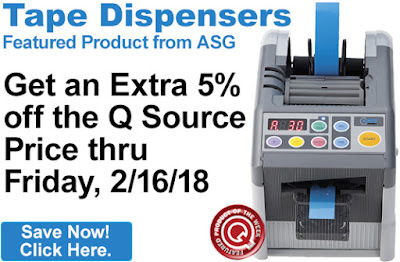 Get an Extra 5% off the Q Source price of ASG Tape Dispensers. To take advantage of this discount, just add an eligible tape dispenser to your shopping cart. Our Featured Product promo is valid Monday, February 12, 2018, through Friday, February 16, 2018. Eligible tape dispensers are for use in commercial or industrial environments and offer impressive versatility for delicate assembly situations. They cut a wide range of tapes, eliminate wasted tape, and help increase productivity. Please visit the individual product page for each dispenser for more details. Click here to shop for ASG Tape Dispensers. For further questions, call us (800-966-6020), or send us an email. Please note: This promo is valid only at QSource.com.